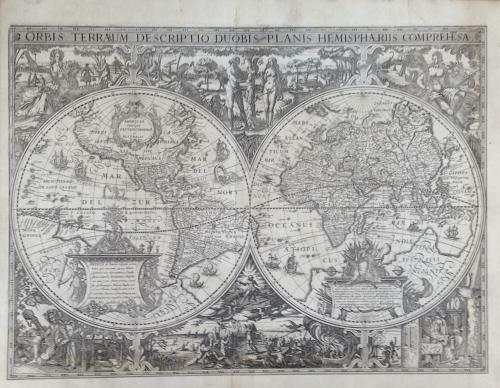 Title: 'Orbis Terraum Descriptio Duobis Planis Hemisphaeriis Comprehesa - Nic Geilekerck fecit - Excudebat Joannes Janssonius A° 1618 - Nicolaas van Geelkercken, 1618, second state. An extremely rare highly decorative double hemisphere map of the World by Nicholas Van Geelkercken, first published in 1610. Nicolas Van Geelkercken was active as draughtsman and engraver, working in Leiden, Amsterdam and Antwerp. The cartographic detail is based upon Van Geelckerken's map of 1610, with dramatic additional embellishment. The cartography follows the work of Willem Blaeu's wall map, except for changes to North America. Van Geelkercken's map was published shortly after Spilbergen's passage around the strait of Magellan (January 1616), although the year is incorrectly noted as 1615. The map is rare: Shirley concluded that it was first published in 1616, however no example is known to have survived with this date and only 2 known examples of the 1617 edition have survived. The signatures on this vividly decorative map indicate the author as Nicolaes Geelkercken and the publisher as Jan Jansson. Geographically, the map is little different from Geelkercken's [1610 world map] . . apart from a redrawn north-east coast of Asia and the omisssion of the lake in North America. However, the rich external decoration is quite new. In the corners there are rural scenes illustrating the four seasons, and, in the upper and lower center parts, panoramas of the Garden of Eden and the last Judgement. Some of the human details, milkmaids, reapers, skaters -- are particularly lively. Shirley noted only 2 examples of the first state and 4 or 5 examples of this second state (1618). The 1632 edition is also an exceptional rarity, with only 2 examples having been noted in dealer catalogues in the past 30 years and none since 1989. Hondius re-issued the map with some significant decorative changes in 1639 and later editions with significant changes have been noted by Muller in an 1872 catalogue, describing a copy of the 1657 edition of Jansson's Waterwereldt, and an even later example (dated 1676) was identified by Lasor a Varea in a reference work published in 1713. Condition: The map has had significant facsimile work performed by a specialist who works for the British Museum. Remargined on the right side and bottom, with lost image on the lower left and right sides reinstated to a very high standard. Please see the verso image to clearly assess the extent of the work. The defects are reflected in the price.